At the turn of the 20th century, HRM (His Royal Majesty) Rex Goliath was the treasured attraction of a Texas circus. People came from far and wide to behold the 47 lb. bird, billed as the "World's Largest Rooster." Our label replicates the one-of-a-kind vintage artwork from the circus banner that hung above Rex's roost, and we proudly honor Rex with our premium varietal wines. Our wines are a tribute to Rex's larger-than-life personality, with bold, fruit-forward flavors that are sure to please. 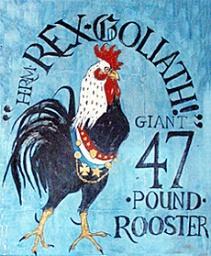 The Rex Goliath label replicates one-of-a-kind vintage artwork from the circus banner that hung above Rex's Roost. We proudly honor HRM (His Royal Majesty) Rex Goliath with our premium, every-day wines that work well with all foods. Rex proudly struts his stuff and makes strong friendships along the way with his fun, audacious personality. As the winemaker for HRM Rex Goliath, Mark Ferguson's key winemaking philosophy is to let the fruit express itself in an easy-to-drink, worry-free fashion.